Tissue differentiation and cellular functions in multicellular organisms require constant communication across cellular interfaces. Exchange of information and signals mostly occurs via assembly and disassembly of molecular platforms that serve as cellular decision-making hubs. In our collaborative research center CRC1348 we are investigating such contacts at various levels of organization, ranging from how particular plasma membrane domains are formed in isolated cells, at interfaces between neighboring cells, to the study of functional consequences of selected cellular interfaces in the organismal context. 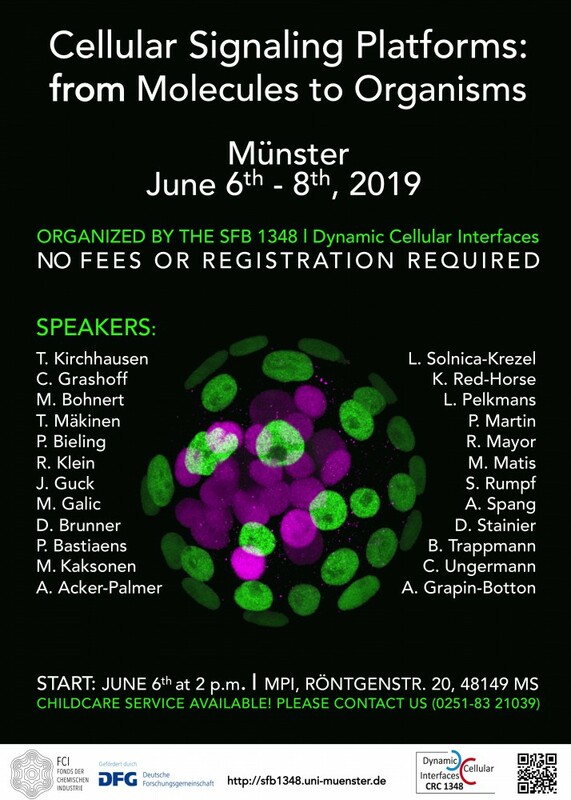 At our first international CRC1348 symposium, we are bringing together scientists to discuss the following topics: membrane trafficking, cell migration, mechanobiology, and vascular, epithelial and neuronal development. One major goal here is to identify common themes that connect the different levels of organization. The meeting is also thought as a stepping stone for young group leaders from the Münster area who showcase as scientific organizers (M. Pitulescu and S. Rumpf) and as invited speakers (P. Bieling, M. Bohnert, M. Galic, M. Matis, S. Rumpf, B. Trappmann). This lineup is completed by internationally accomplished scientists from the United States, Switzerland, Sweden, the United Kingdom, and Germany, including the keynote speakers, Rüdiger Klein, Tomas Kirchhausen, and Kristy Red-Horse. The target audience are scientists from all career stages interested in the topics of the meeting. No fees and no registration required.